Hello Stampers! Don't you love sketch challenges? I do. It's a great starting point for me. 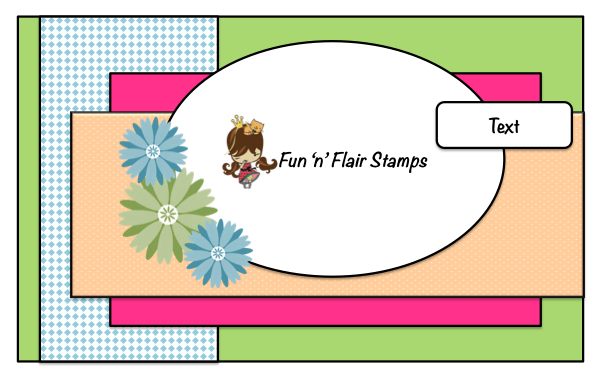 Today is our 2nd Fun 'n' Flair sketch challenge. I am using the Miss Shayla at Christmas Time set. This little mouse is just so cute in the little teacup. I used a Spellbinder die to cut out the shape then stamped the image. I ran the kraft cardstock through my Cuttlebug using the Swiss Dots filer. I also added stitchings, buttons and a bow using red and white twine. I used the sentiment from the Penguin Christmas set. 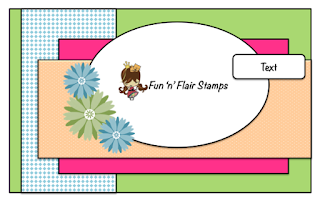 Now it's time to go over to the Fun 'n' Flair blog for more DT inspirations. The ladies have created beautiful projects to share with you. Here is this month's sketch for you to play along. Lovely Card...Thanks for joining at Penny's. Really cute card, great colours & I love the sketch! Gorgeous card, Kim...lovely colouring of that cute image....thanks for joining the Anything Goes Challenge of Wags 'n Whiskers! Really beautiful card, love the colours and stitching detail. Fun card Kim. I love all the stitching. Wonderful card! Thanks for playing along at FOSTV. sweet image!!! Wonderful DP! Don't you just love the look of pleasure she has while munching that cheese!